For a calendar of where you might find me, click here. Wishing a joy-filled 2014 to all of you! The year has been launched, but is still less than 10% underway. In fact we've seen just enough to verify that yes, indeed, this is a year full with promise! 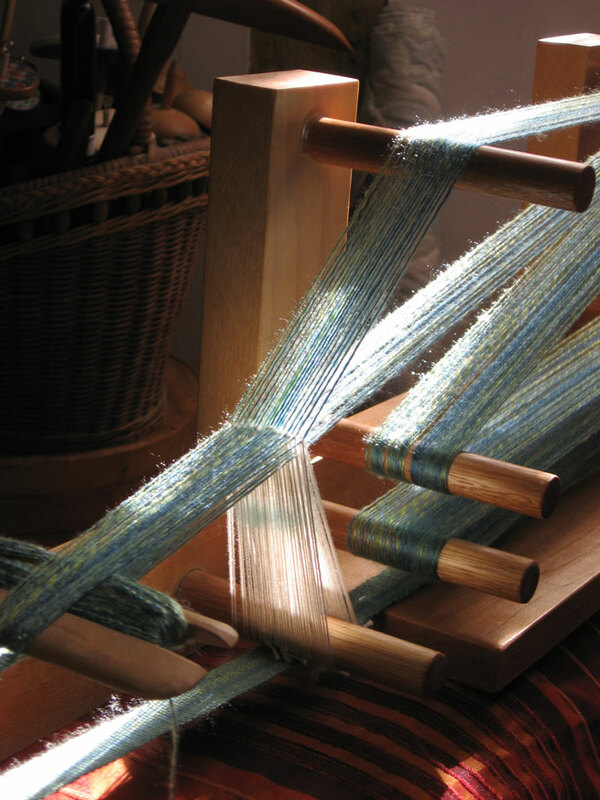 May the year 2014 be generous to you, bringing love, joy, health and prosperity; and may all your weaving and spinning ventures reward you with pleasure. It seems too early to me, but let's talk about the winter holidays. We all know the mails slow down in December -- so (you might ask) what is the latest date you could order something from this website and still have it arrive by December 24th? The answer: December 6th. An order placed by that date should arrive anywhere in the world in time to be wrapped in sparkly paper and tucked into a stocking or under a tree. Now, if you're like me and don't really want the season to start before its time, you could order as late as December 13th or 14th -- but there's a chance the package might be late. If you really are a last-minute shopper, or if the post is holding things up -- there's a way around that, too: I'd happily email you a nice photo to wrap and put under the tree as a promise of things to come. 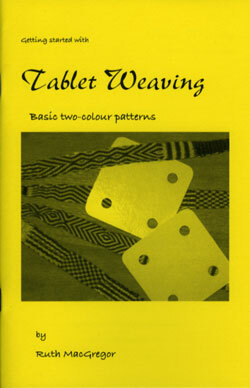 After a brief absence from active duty, this introduction to tablet weaving is now back in print and available. Yay. As I've said many times, this is the book I wish I'd had when I started tablet weaving. It will lead you, step by step (and photo by photo), through the basics of setup and weaving -- and at the end of it all, you'll know how to create your own two-color patterns without having to follow a "recipe". Oh dear. I've outsmarted myself again. In a well-meaning effort to keep things up-to-date and lively, I posted notices here and there about when I would return from my April show travels. And here it is, nearly mid-June, and I suddenly see that many parts of this website still say "I will be back at the beginning of May". Will you be near Bath, England this month? If so, think about stopping in at the Stitch and Creative Crafts show in Shepton Mallet! I'll be there with my friends in the Braidmakers' Workshop in booth A24, and we'd love to see you. 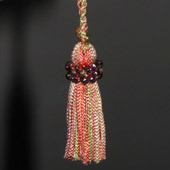 In addition to braiding (really, it's a lot of fun), I'll be teaching my class Silk and Spindle each of the four days of the show. 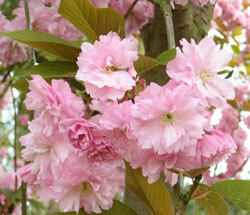 The show runs from the 25th through the 28th of April at the Royal Bath and West Showground. For more information, click here, then scroll down and click the button for Shepton Mallet. Silences are oh-so-sweet when they're finally broken! 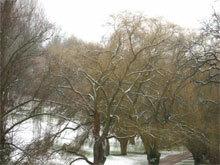 As we move forward in this promising new year, the days lengthen and stretch their wings. Blank, fresh calendar pages open to the light of the almost-spring morning, eager for whatever lies ahead. Take a look, enjoy -- and welcome. I'm baa-aaack!! It's been a most unusual year. The first nine months were dedicated Braids 2012, an amazing international conference held in August in Manchester, England. The Proceedings of the conference were published in a beautiful 160-page book -- and as one of its editors, I can attest that a book can move into your life and lay claim to every waking minute! 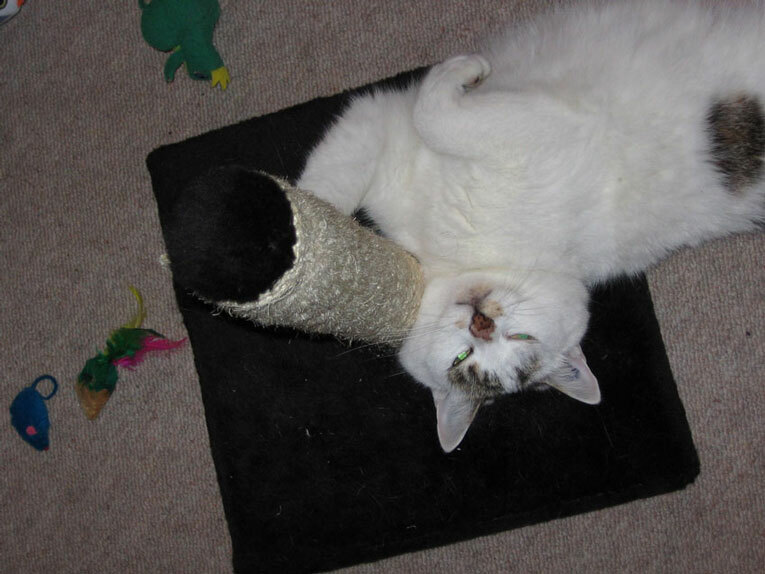 It was both hard work and pure joy. Autumn brings new things. Keep an eye on the Products pages! In wool and silk and cotton. 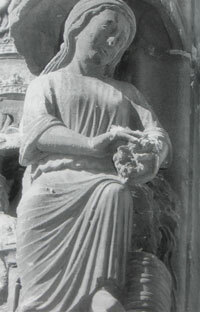 Of love, and truth, and kindness. Spinner friends, bless your hands. Wishing you all a happy and dazzlingly inspirational 2012. Care to join me for a cuppa? Some things are too good not to share, especially as our spinning community really is worldwide. 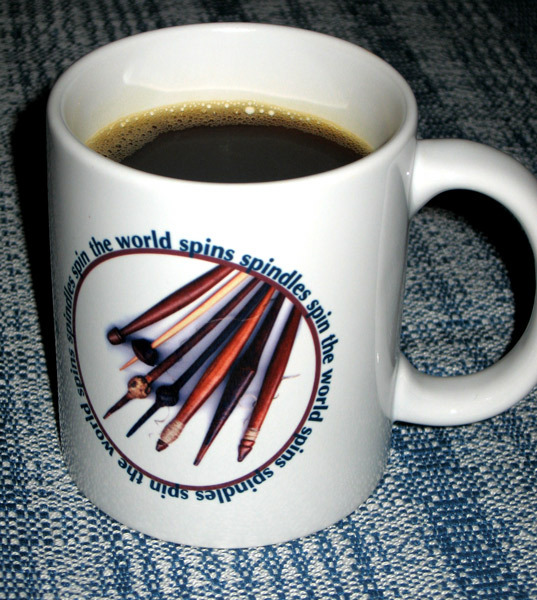 This mug displays a small corner of my spindle collection, with spindles hailing from France, Africa and Colombia (click on it for a bigger view). If you like it, you can get one of your own! This mug (and other useful goodies) are available from my new store on cafepress.com. More designs will follow in the coming months. ...Interested?? Click here to see more! 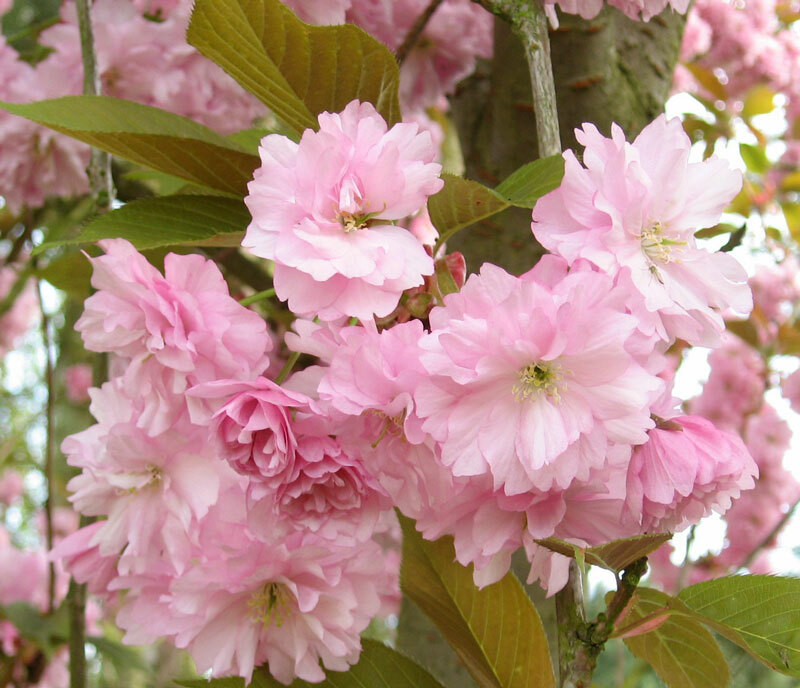 Spring is springing with alacrity! A New Year dawns, even as we hibernate. I wish a warm, love-filled, prosperous New Year to friends near and far. Hibernating or not, you deserve a good one. 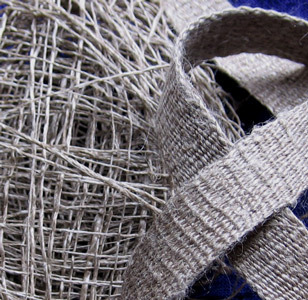 Times have been rugged, but they can't stay that way -- so take heart, lift a glass with a friend, pull some fibre from the basket, and let the spinning commence! Happy, happy 2011, dear friends. 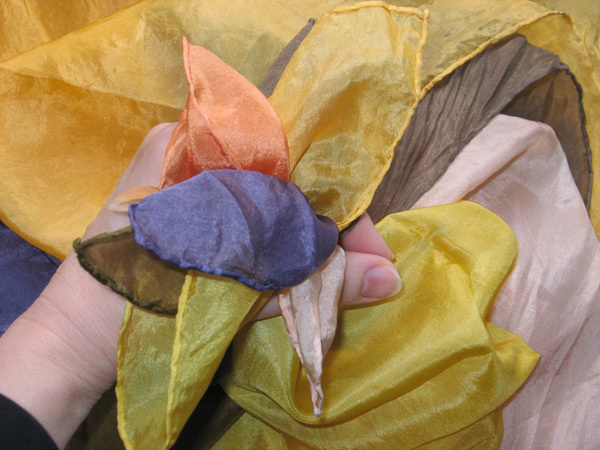 Did someone mention colourful silks?? We've got them! 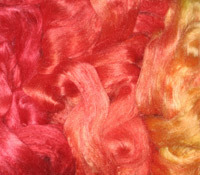 ...Okay, that's not news, really, because silks are always in stock here -- but the Silk fibres page of this website just got a facelift. You can now actually see all the silk colours available, and you can choose your own colour combinations when you order. Take a look! You can get there with the "Silk fibres" link above, or by choosing Products on the menu at the left. ...Happy spinning! 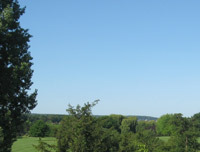 The sky is a clear blue, and the mails are back to normal! The volcanic ash cloud has shifted out of European airspace, and the volcano itself has slowed down -- so no ash-related events are in the forecast. Oh, what a volcano can do! As many of you know, I live in France (most of the time) -- and for the past week, the planes that normally come and go at French airports have been grounded. 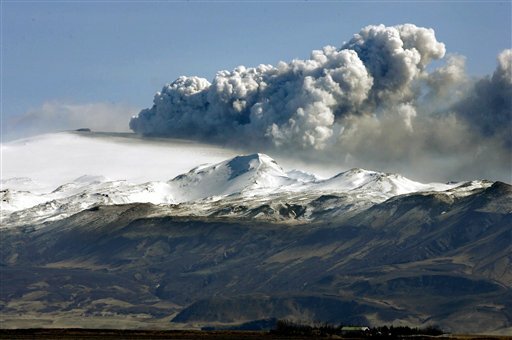 The Icelandic volcano with the amazing name is the cause -- and its ash plume affects everything from travel to the mails. The mail delays are surprising, but real (letters and packages travel by air, too!). What that means for us (i.e., you and me) is that if you're not in Europe right now, and you order something from this website, your package will take some extra time to arrive. ...The airports are gradually resuming normal activity as I type this, so the problem will probably be resolved within the week. Volcano willing. May 2010 bring you new projects, new ideas, new friendships, and new skills! The buttons are back! The buttons are back! 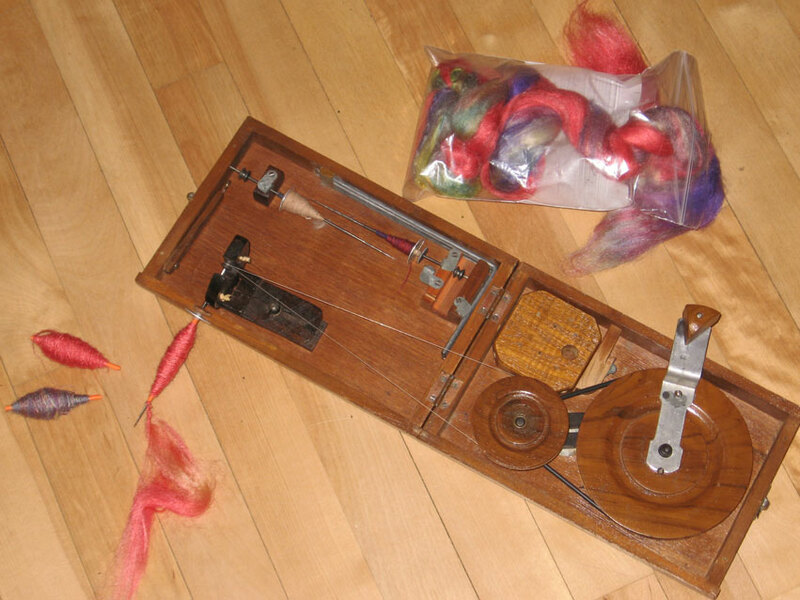 The "Add to Cart" buttons have been re-enabled on this website's Products pages -- so those silks, spindles, and weaving kits you've been pining for since September are once again online and available. 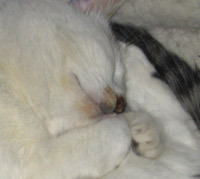 As usual, if you have any questions, just click the "Contact Webmaster" link at left and I'll get back to you shortly. More goodies are coming your way this winter, so stay tuned! 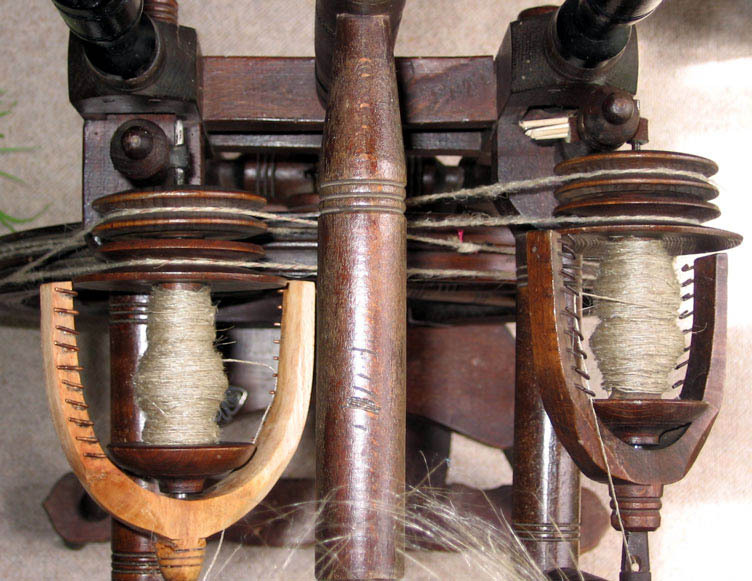 WeaveZine, an excellent online weaving magazine, has published an article (by me!) 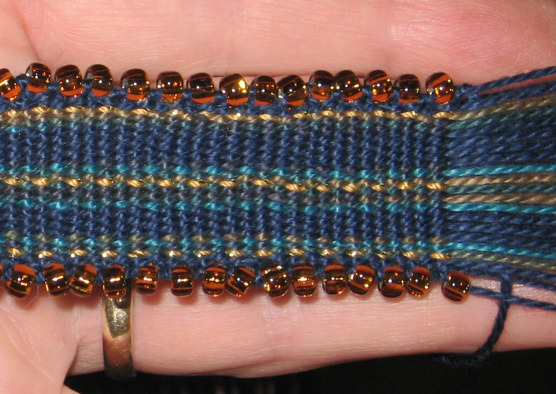 on weaving narrow bands with beads all along their edges. 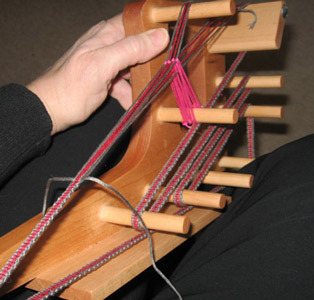 The bands are woven on small rigid heddles, but the technique could also be used on inkle looms, backstrap looms, or larger looms as well. It's beautiful stuff, fast-weaving and satisfying -- and it's really easy! This notice comes a little bit after the fact, but better late than never. ;-) Click here to open the article in a new window. An update on readily available goodies: a few more things are back in action on the Products page, with their "Add to Cart" buttons duly reactivated! In addition to the two books mentioned earlier, the fetch hooks are once again ready for immediate ordering. As always, the hooks are available in your choice of brass, silver, or steel. Just to keep things interesting, there's also something new in the Products pages: handmade shawl pins in your choice of copper or brass. Those of you who shopped at ANWG last spring may have seen them: hammered spirals that effortlessly keep your shawl or scarf in place without piercing the yarns. 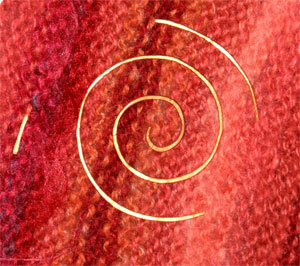 ...It's taken a while to post the photos, but these shawl pins are now available here online. Some years don't go as planned, and 2009 is certainly one of those! Things were just getting back to normal back home in our apartment, then boom! I am once again in the States because of a family emergency. I'll be here until November. A few things are still available for immediate gratification, though. 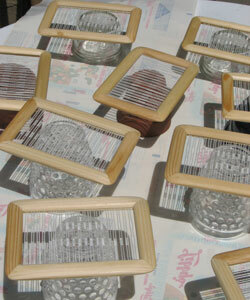 The books are available -- including the new tablet-weaving book! 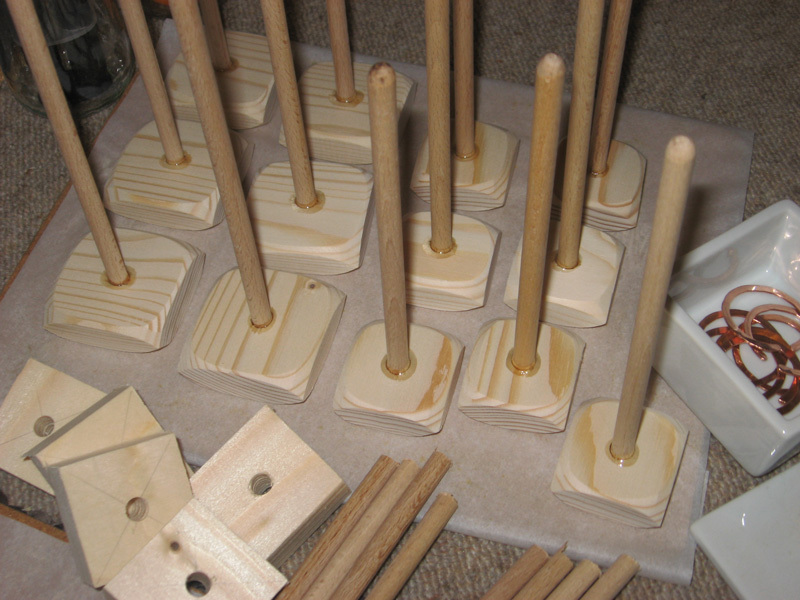 In a week or so, a few wooden tools (heddles and spindles) may become available, too -- and I promise to announce the news when it happens. Until then, I thank you for your patience. Happy New Year to you, wherever you may be on the planet! May 2009 bring you hope, joy, health, prosperity, and a thousand pleasures. For more information on the U.N. initiative, check out their video presentation by clicking here. Their pleasant web page will open in a new window. 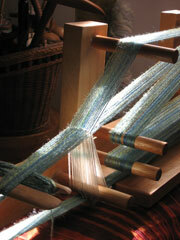 I'll teach classes in spinning silk at the shows in Dublin and Harrogate. For information on the shows, their venues, costs and classes, click here. Despite the show's name, it has offerings of interest to anyone working with fibres, yarns, colours, papers, beads and cloth. If you're nearby, stop in and join the fun! Click here to open the Articles index -- or simply follow the Articles link at the upper left. New articles appear at the top of the list. Behind-the-scenes work is often rewarding because it can make an enormous difference in what you see and experience "up front" on the public side of the velvet curtain. 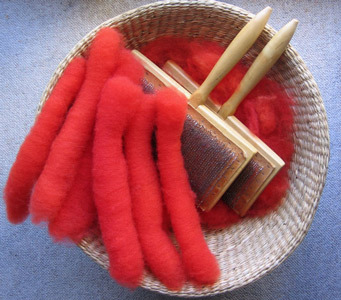 On the Articles page of this website, an article on washing wool fleece has languished for months in a plain-text format, waiting for its illustrations. It has finally received them. :-) ...In celebration of that event, the article itself has been expanded and deepened; so even if you've checked it out before, it might now be worth another look. Do you have a raw fleece at home, waiting for your attentions? Click here to go directly to that article -- or follow the Articles link at the left and scroll down the page. Convergence has come and gone, and so have the summer travels. I'm now back home, recovered from jet lag and back in the swing of things. 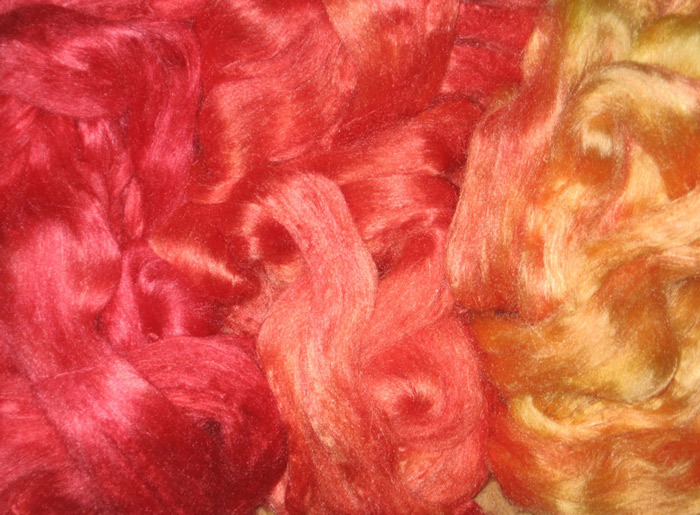 The most notable news of the day has to do with the Products page: the dyed silk tops are still available, but they won't be ready for shipping until late August (I'm out of stock and need to dye more!). The fibres and duos of colour are still shown and listed on their Product page, but I've temporarily removed their "Add to Cart" buttons. 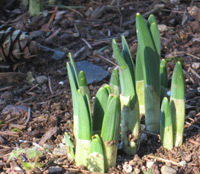 ...Never fear, they will return -- and soon! It's the Convergence season, and I'll be in Tampa for the festivities. 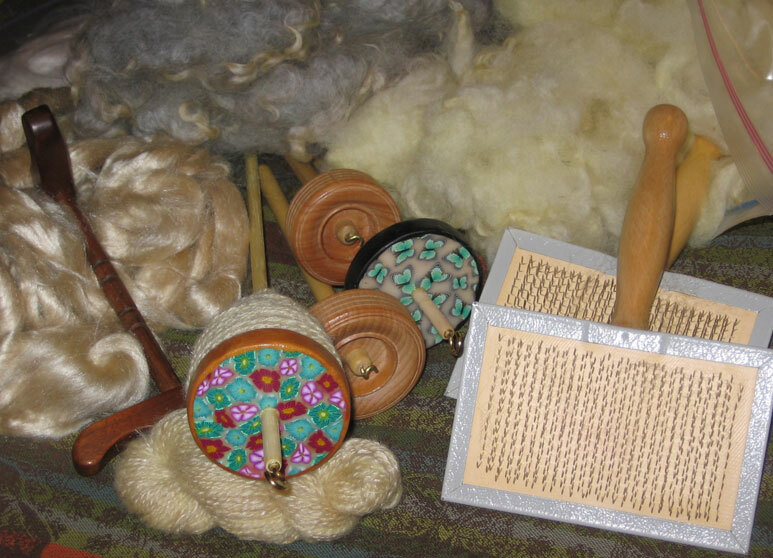 :-) My spindles, silk, heddles, booklets and other delights will be on parade in a section of the booth I'm sharing with my friend Shirley Berlin. Things have been happening on the Products page of this website: the furniture has been shifted around to make room for new additions (such as the tablet weaving kit shown at left), new pictures, and more information. That's the good news. The not-so-good news is that some prices have had to be adjusted. Another show has come and gone, with its fullscale preparations beforehand, its four days of grand flurry, and its aftermath of information overload. This time it was the "Stitch and Craft" show in London -- and I'm delighted to announce there are 24 new silk spinners in England. 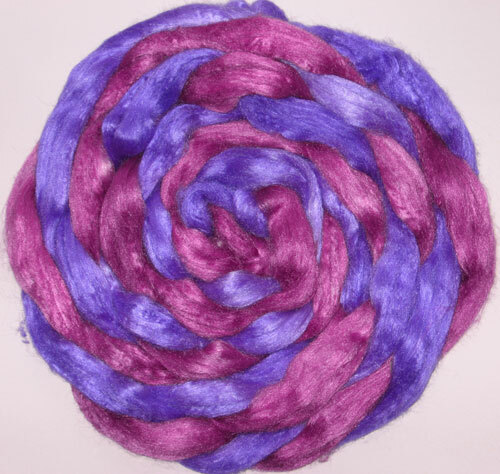 Congratulations to all of you -- may your beautiful new yarns bring you lots of joy! Sometimes it's nice to get things moving, and I'm happy to announce the first of what will one day be many videos in the Articles section of this website. 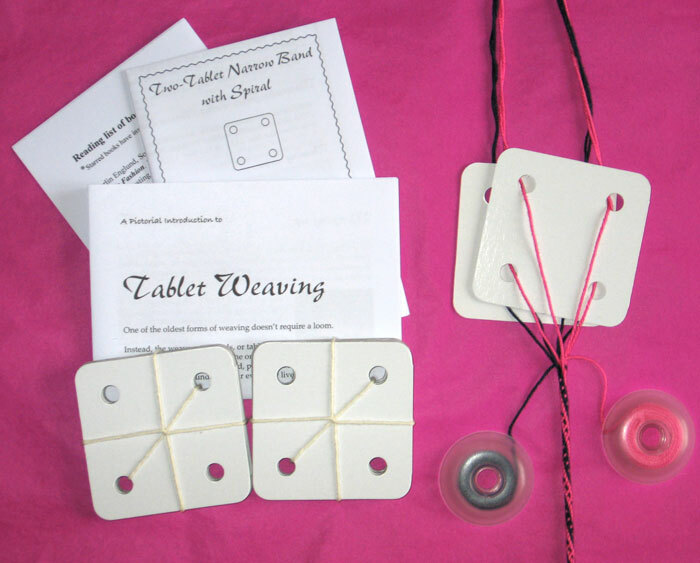 These first videos provide an introduction to inkle weaving -- the weaving of narrow bands, tapes, and ribbons on an ingenious (and simple) loom. 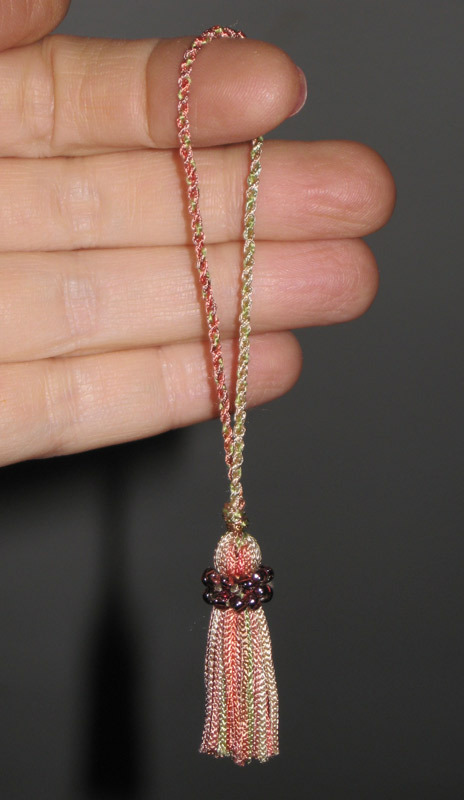 Narrow weavings are of special interest to handspinners: we often find ourselves with small-but-beautiful skeins of yarn and no idea what to do with them. 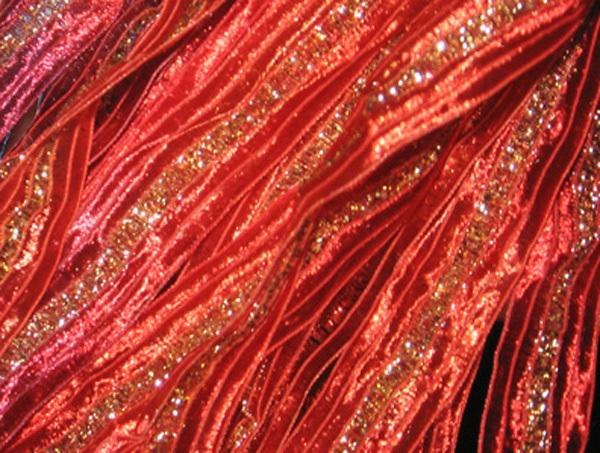 In narrow bands, those yarns can be showcased -- and used! Interested? Curious? Then click here -- or simply follow the link at left to the Articles page. Is that a nouveau-punk spindle??? ...No, it's a protected one! 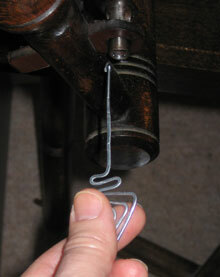 The hook of a top-whorl spindle is its most vulnerable part. Sooner or later, all of us who indulge in the pleasure of using these tools will know the heartbreak of The Wobbles, when our once-perfect spindle suddenly has a bent hook. 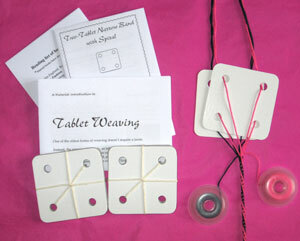 Want to see a spindle protector that takes just minutes to make and costs only pennies?? Then click here -- or simply follow the link at left to the Articles page. 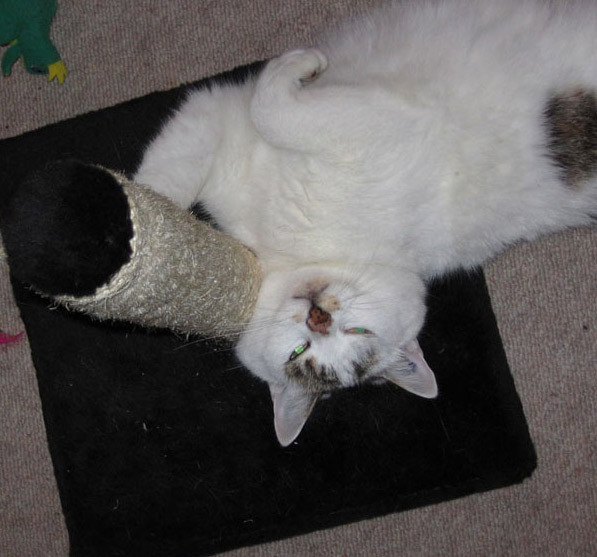 May 2008 bring you all that you desire. The holiday travel season is now in full swing, and like so many of you, I'm away from home visiting family. Interested to see what came along in my suitcase?? 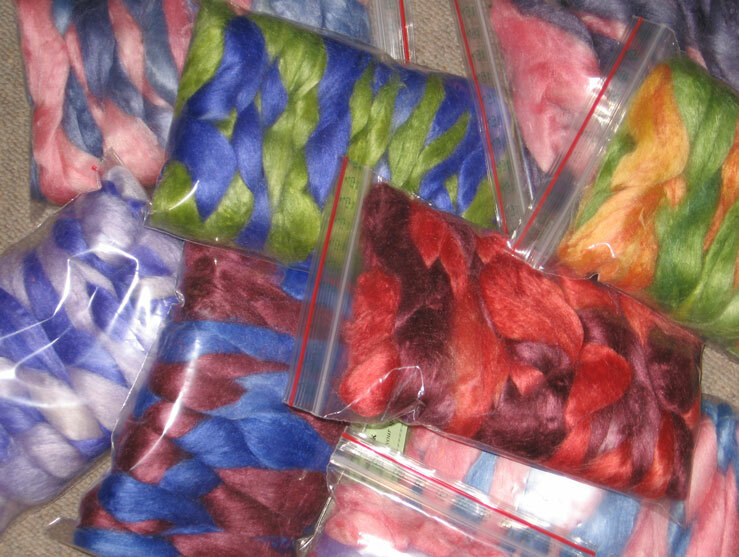 Holiday spinning is enjoyed in stolen moments, so it's not the "usual suspects" this time -- the mini-cards and big fibre bags stayed at home. ...Click here to find out more. Interested?? Click here for photos and all the details! This is the day on which the sun sinks below the horizon in places north of the Arctic Circle. It will not rise up into view again for just over a month. The long night is quiet, dark, and deep-blue cold. 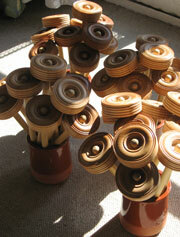 Light the candles, put the kettle on, stir the dyepot and oil the wheel. The season is upon us! The Knitting and Stitching shows have come to an end for another year -- and I'm delighted to announce that there are 83 new silk spinners in the U.K. and Ireland. Thanks to you, my students, and congratulations on your new skill! ...May it bring you hours, weeks, and years of pleasure. It's the Knitting and Stitching show season again in the British Isles, and the action unfolds in four venues: Birmingham, London, Dublin and Harrogate. I will be teaching classes in silk spinning at all shows except London. For more information on the shows, their venues, entry costs, and classes, click here. Despite the name of the show, it has offerings of interest to anyone working with fibres, yarns, colours, papers, beads and cloth. If you've been before, you know what it's like -- but if you've never been, it's worth it! Something is happening in my workroom, and it's happening with both hands! The wheel that followed me home from my travels is finally ready for work, and we've just taken our first spin together. Click here to see what we're doing and how we got here. 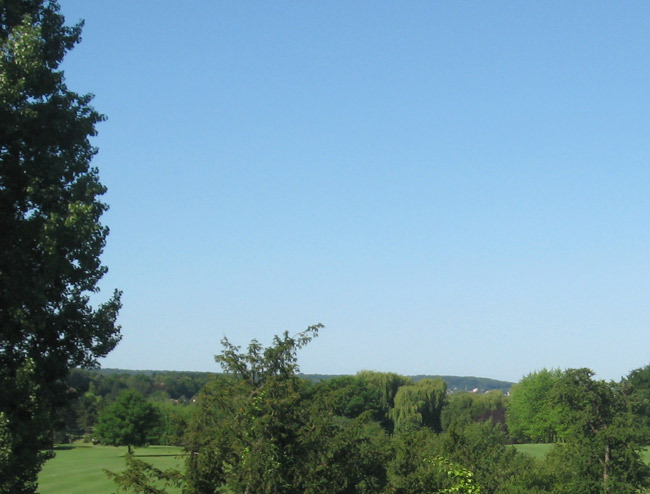 Springtime comes with thoughts of travel, and this year is no exception: I'm away visiting family for a few weeks. That doesn't mean I'm away from handwork, though. 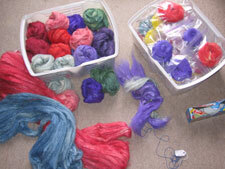 There are fibers to be processed, yarns to be spun, budding projects waiting to blossom! Click here to see what came along in my suitcase. It's been a busy week here, with unusual materials: I've been working with metal! The whole thing started when I couldn't find my fetch hook. To cut to the chase: I made a new one out of galvanized steel (hammered into shape by my own hands). The hook is pretty, and making it was so much fun that I made a bunch more to keep it company! This all leads up to a happy announcement: if you need a new fetch hook, you can have one, too! For details, follow the Products link in the left-hand column, or click here. It's the end of January, and I've been busy. In the last few days, every page of this website has been brought up to date. Welcome, and check it out! 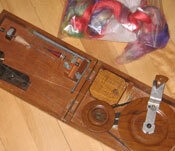 Announcing a new article: A minimalist drum carder. 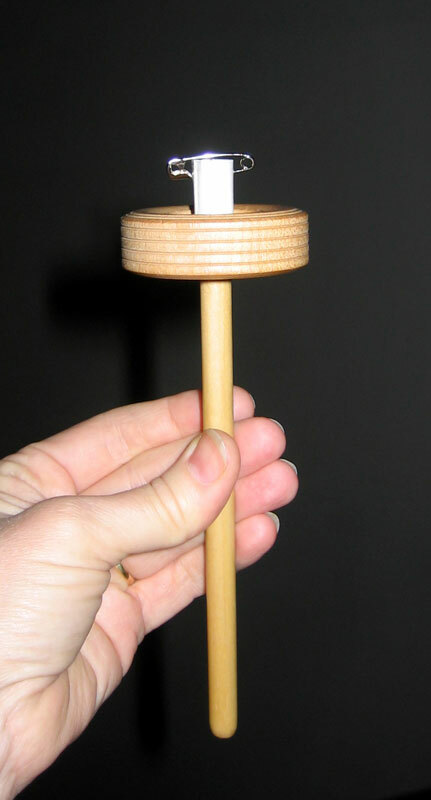 This article describes the design and construction of one of my favorite fiber tools: my carding drum. It's simple and effective, and its cost was just a fraction of the price of a commercial drum carder. Click here to learn more about it. Be you distant or near! but the wish is sincere. The Knitting and Stitching Shows have come to an end, and I'm pleased to announce that there are eighty-six new silk spinners in the UK and Ireland! 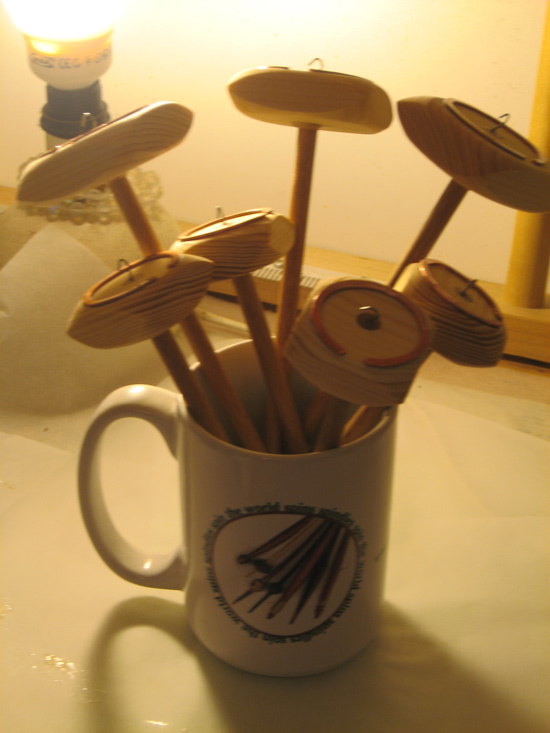 That's how many people attended my silk spinning classes at the shows in Birmingham, Dublin and Harrogate. I am proud of all of them! Every one of them was making nice-looking yarn by the end of the hour. ...Nice people, too. Kudos, new friends! In re-reading Elizabeth Barber's The Mummies of Ürümchi (which I confess to having read in patches before), I'm again struck by the vividness of colors in textiles found in those eastern deserts. 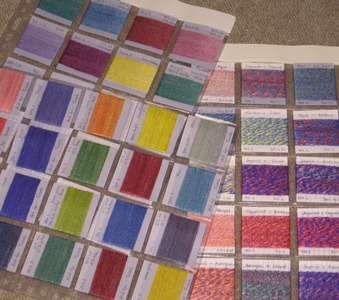 She carefully describes the nuances of color and admires the skill of the dyers, but I haven't (so far) found information on the actual dyestuffs used. And I'm intrigued! It happens almost every autumn: as the days get shorter and darker, I yearn to get out the dyepots. 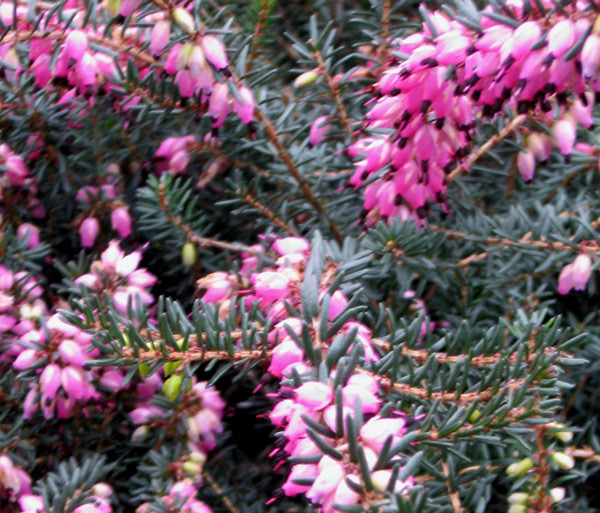 Stay tuned over the next few weeks, because color is likely to occur! 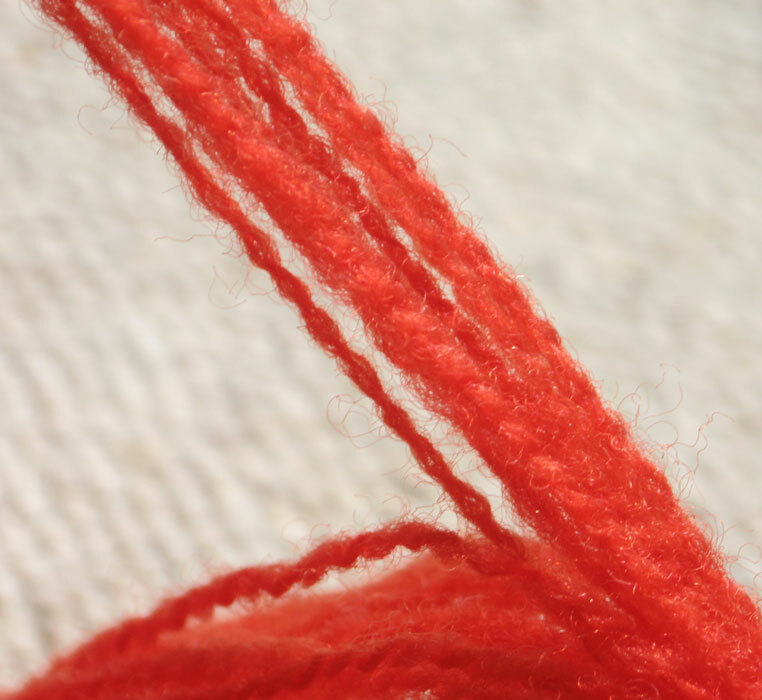 It's Knitting and Stitching Show season in the UK. Birmingham hosts the first of the series, a place of honor for this new venue. The shows in London, Dublin, and Harrogate unfold in the weeks that follow. 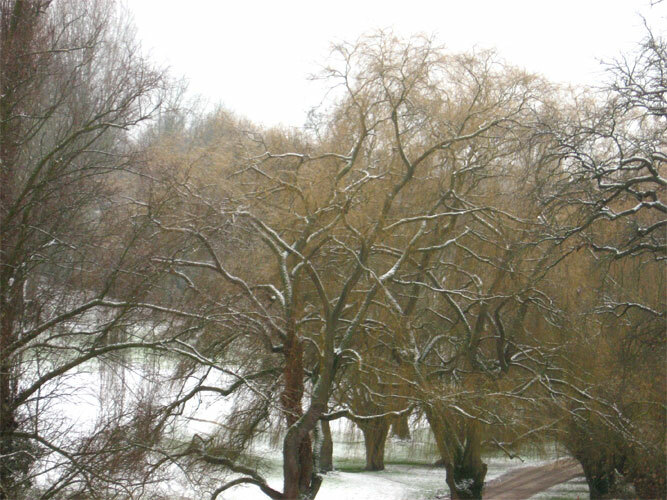 Any of them offers a great escape from those autumn blues! I'll be teaching classes in silk spinning in all the shows except London. For more information on the shows, their venues, entry costs, and classes, click here. They're fun events, with enormous vendor halls -- and the shows embrace a world far beyond that of knitting and stitching, with offerings to please weavers, spinners, beadworkers, paper artists, felters, and sewing enthusiasts. A new book on yarns. A new book to catch the attention of handspinners, weavers, knitters, and other fiber artists has hit the shelves. Published earlier this year, The Yarn Book: How to understand, design, and use yarn was written by Penny Walsh. Its cover states it is one of the new Textile Handbook series from A & C Black Publishers, but I have yet to find more information about that series. The Yarn Book begins with a history of spinning, then investigates the materials used to make yarn. From there, it explores yarn-spinning mechanisms, techniques of handspinning, uses of yarn in fabric, and the structure and role of contemporary yarns. I haven't finished reading it yet, but it's already clearly a vibrant addition to my bookshelves. The information is well-presented and well-researched, and the photography is as useful as it is beautiful. Though this isn't a book that will teach you to spin, a section in the handspinning chapter covers yarn design in a usable, inspiring way (I've found some gems of ideas there that I want to try!). It's been a good weekend: there are new things to see on the Articles page. As this website grows, the number of articles collected on that page will grow, too. Take a look! Streamlining is a nice thing. As of today, all photos on this website (except those in the title bar of each page) are now "clickable thumbnails". That means the pages and pictures will load quickly (cutting down on the well-known World-Wide Wait). It also means that if there's a photo you'd like to see in more detail, all you need to do is click on it -- and a bigger version will open in a fresh browser window. Here's an example, using the picture from the top of this page. Click on it, and you'll see the greens of her eyes. 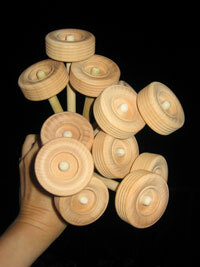 Louet has announced a new spinning wheel. The S95, also known as "Victoria", will be available starting in October. It is a portable wheel with Scotch tension and multiple ratios, and according to Louet, it's the smallest folding wheel on the market. Click here for more information. ...I want to try it!! This is it -- the SpinningForth.com website has been launched!